Digital scaling meter M4Y/M4W/M4M/M5W series consists of various kinds of model types including indicator and single/dual preset type to allow users more diverse selection. 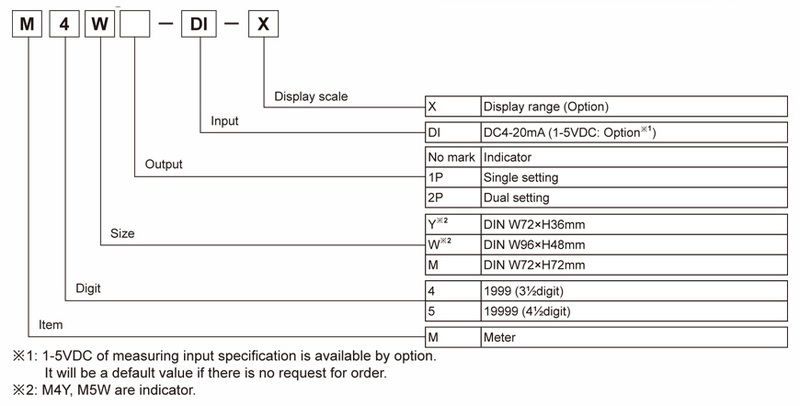 Also, it improves users convenience with linear display function depending on input specification and 19999(M5W), 1999(others) of maximum display range. Power factor indicating panel meter M4W-P realizes high visibility with character height 14.1mm. Also, the series has DC4 – 20mA of input specification and -0.50~1.00 ~ +0.50 cosØ of display range so that a wide range of applications can be made with the series. Small size panel meter M4N series realizes space saving installation with compact size. Moreover, easy operation can be ensured with diverse functions including built-in Auto Zero function and Hold function. Max. display range of 1999 is another feature of M4N series. Panel meter for measuring DC, AC voltage M4Y/M4W/M4M/M5W series consists of various kinds of model types including indicator and single/dual preset type to allow users more diverse selection. Also, RMS/AVG value selection function contributes to better users’ convenience. Diverse functions including Auto zero function, Hold function (except M5W) and 19999(M5W), 1999(others) of maximum display range are another feature of this series. Digital scaling meter M4NS/M4YS series adopts loop powered power supply type which providing power supply from measuring input so that it can run inner circuit without additional power source. Various functions including -1999 to 9999 max display range, free scaling function and monitoring display value and peak value make the series more user convenient ever. 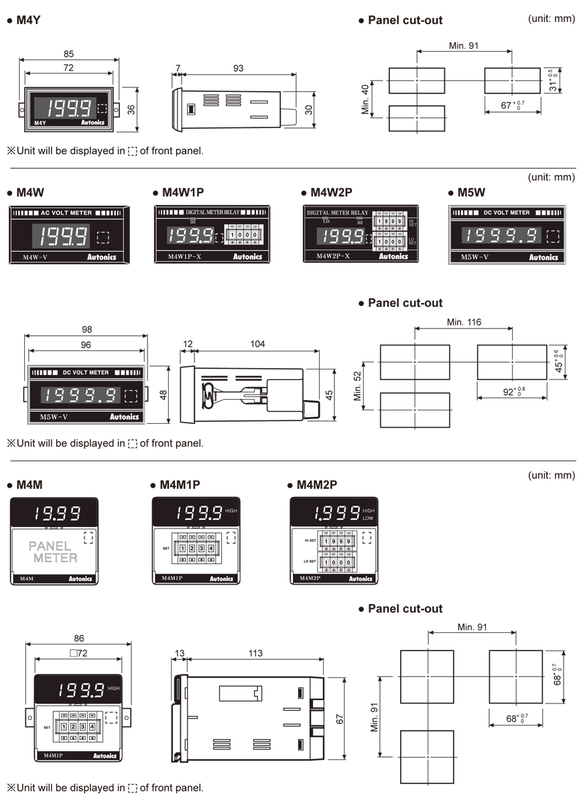 The M4NN Series panel meters are upgraded from the M4N Series, with diverse input options, power factor display function, and added output function. The input and power terminals are also insulated to provide safer operation and allow multiple units to be powered by the same power supply. Plug-socket terminal block connection is also available to provide user-friendly wiring and easier maintenance. The added functions and flexibility makes the M4NN Series the perfect option for measuring and displaying process values in diverse applications. Graphic panel meter specialized for mosaic panel M4V series can implement various measuring input. The series increases customers’ convenience with error display function and self diagnosis function. In addition, M4V series realizes max display range from -999 to 9999 and high reliability measurement with built-in Microprocessor. 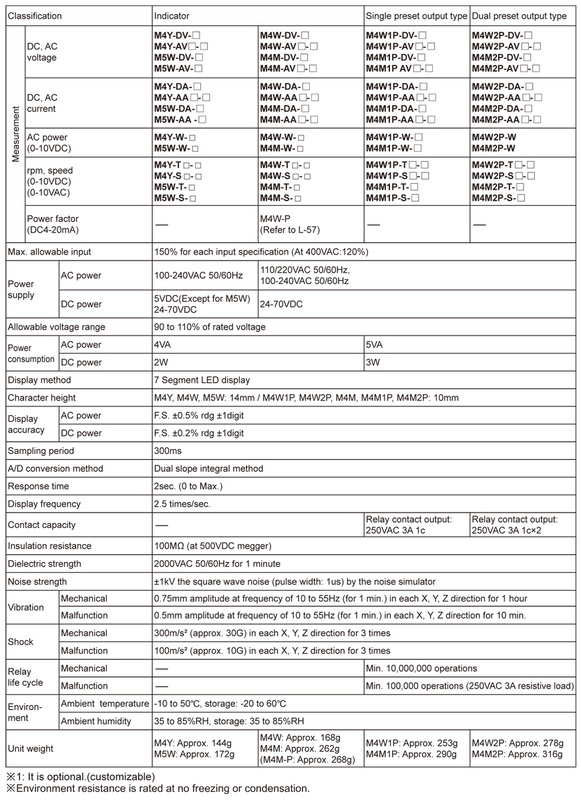 Panel meter for measuring AC power M4Y/M4W/M4M/M5W series is to display output (DC 0-10V) from power converter consists of various kinds of model types including indicator and single/dual preset type to allow users more diverse selection. 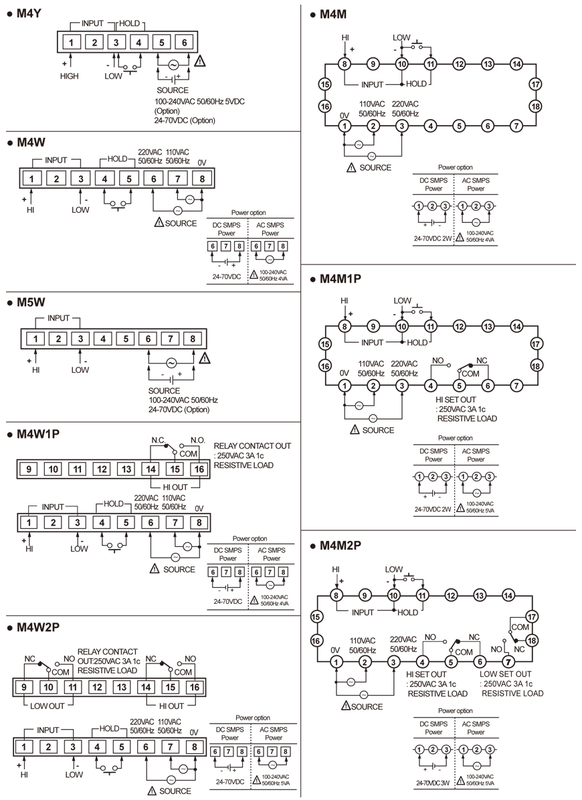 This series can cover DC 4-20mA or DC 1-5V output option in order to make a wide range use. Diverse functions including Auto zero function, Hold function (except M5W) and 19999(M5W), 1999(others) of maximum display range are another feature of this series. Panel meter for measuring DC, AC ampere M4Y/M4W/M4M/M5W series consists of various kinds of model types including indicator and single/dual preset type to allow users more diverse selection. Also, RMS/AVG value selection function contributes to better users’ convenience. Diverse functions including auto zero function, Hold function (except M5W) and 19999(M5W), 1999(others) of maximum display range are another feature of this series.